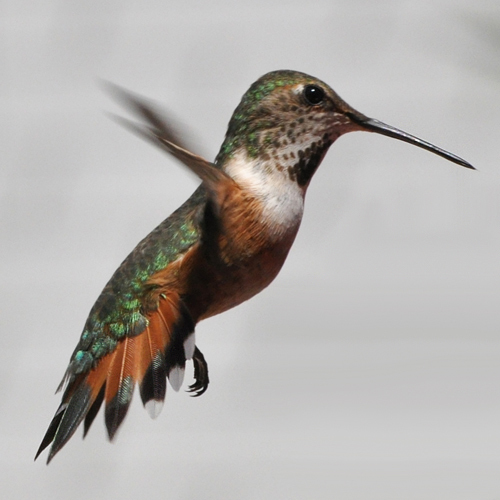 The Rufous Hummingbird is a migratory bird that only visits our Phoenix area home in late summer on its return from the NW US to Mexico. 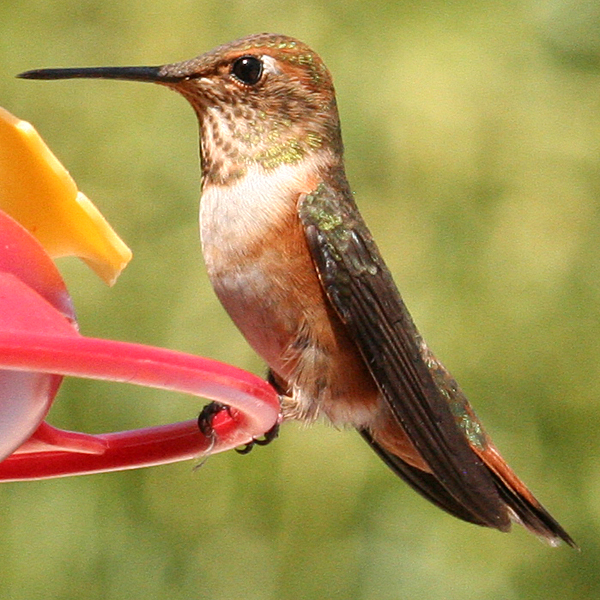 It has the farthest northern range of all hummers. All of these shots, with the exception of one (noted), were taken in our backyard SE of Phoenix. 2012 is the first year in the five years of keeping records that I have been visited by an after hatch year male. 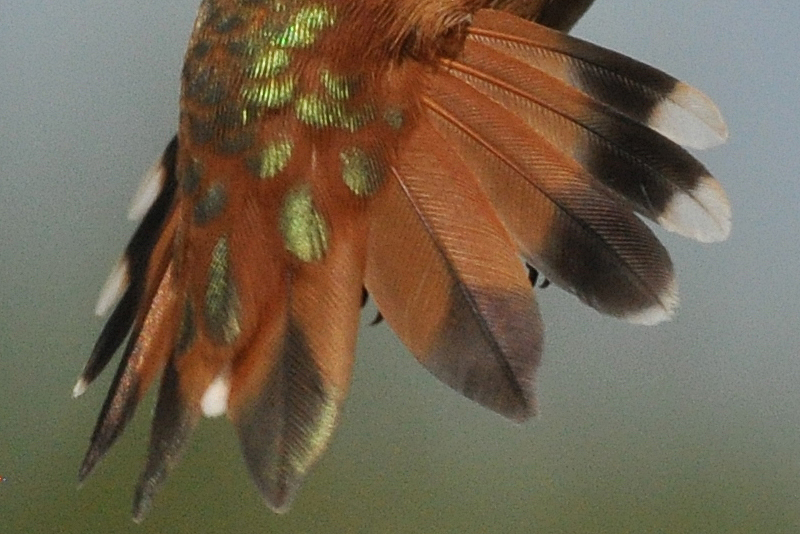 Rufous Hummingbird after hatch year male. Rufous Hummingbird male hatch year, a very common visitor in August. It took me six years before I captured an adult female. 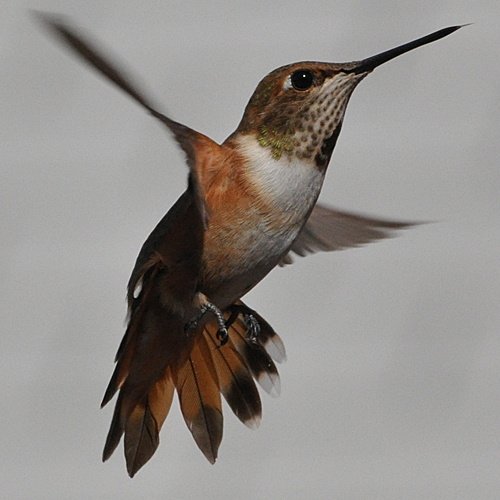 A hatch year female Rufous Hummingbird. 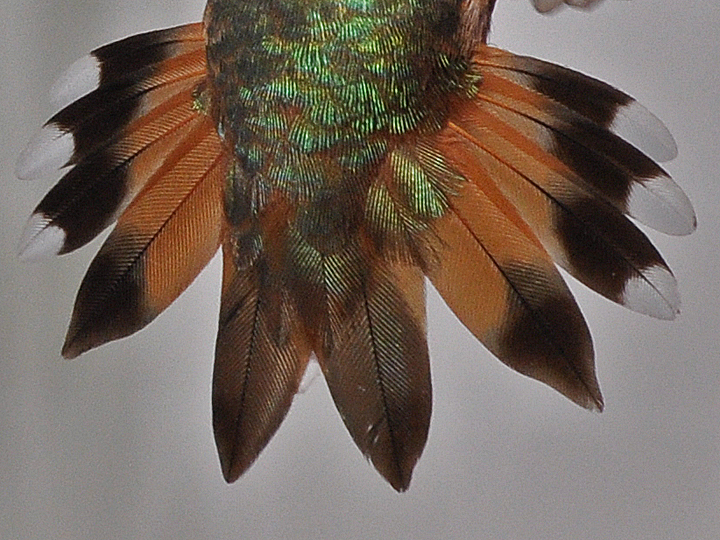 The following picture shows a Rufous Hummingbird male hatch year in molt. Note that R4 and R5 on the right side are adult plumage. 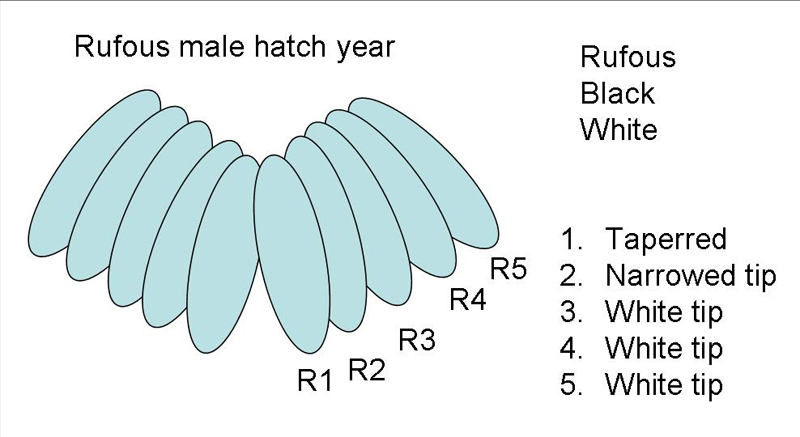 Hatch year birds typically do not molt till they reach their wintering grounds. Both R1’s seem to be a bit worn. I have not seen this worn condition on any of the other juveniles that I have encountered. What is important about this shot is R2. 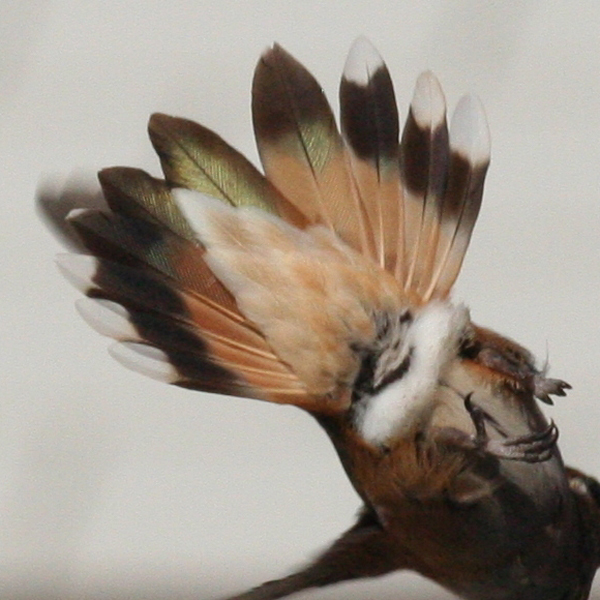 Notice how clean the demarcation is between the black tip and the rufous (also shown in the shot above). 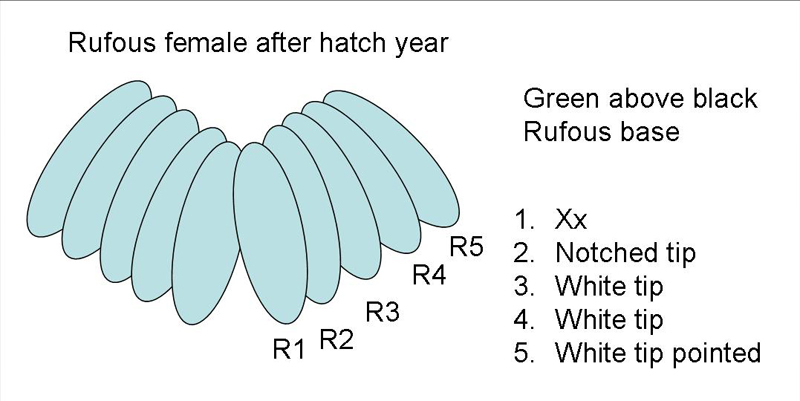 A female, whether hatch year or older would show some green coloration above the black. 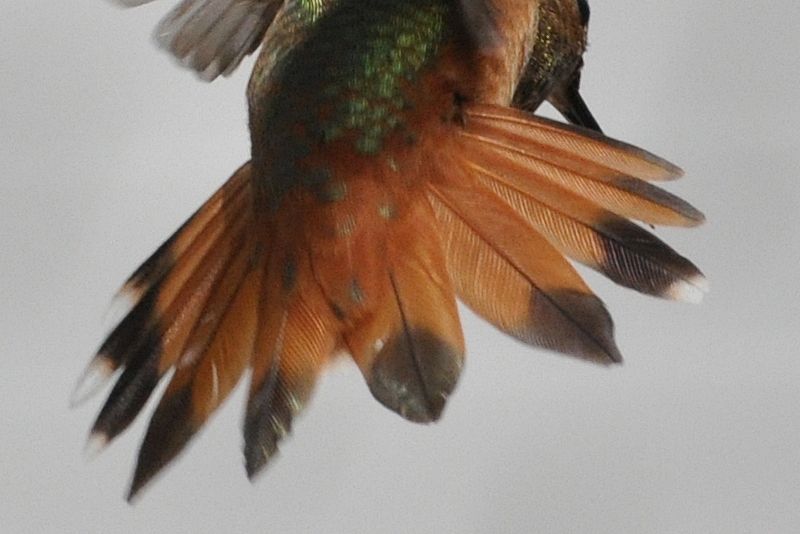 Rufous Hummingbird female after hatch year. 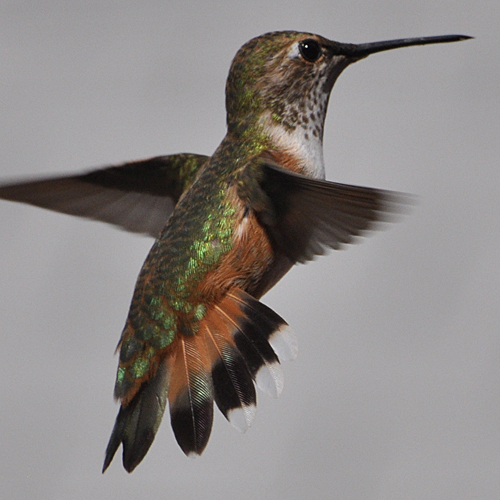 The very distinct coloration above the subterminal black and the pinched end of R2 identifies this bird. 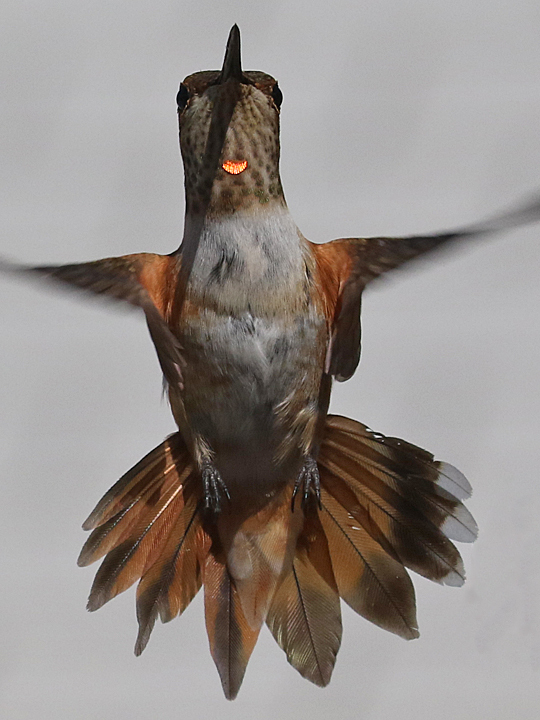 The shape of R2 and the width of R5 distinguishes this Rufous female from Allen’s. 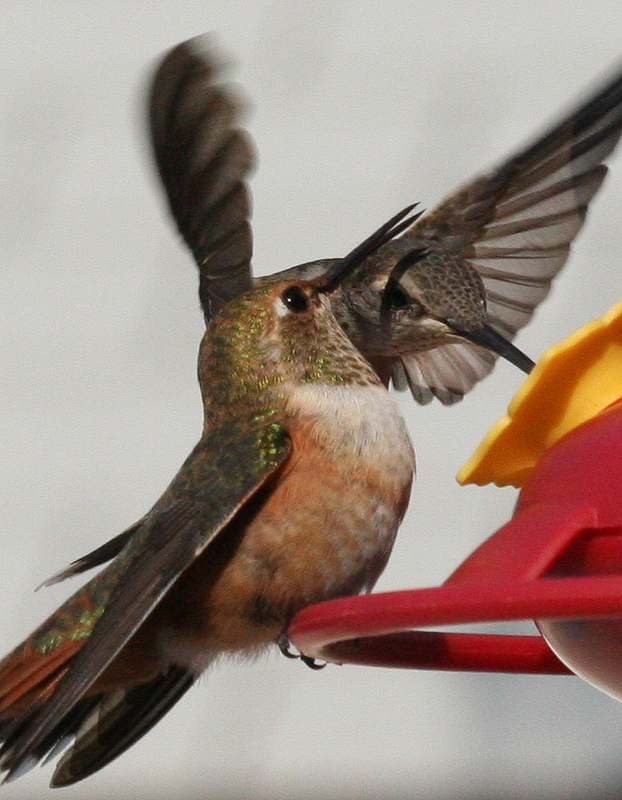 Another one taken at home shows the clean chin, adult gorget feathers, and more extensive coloration above the sub-terminal black. 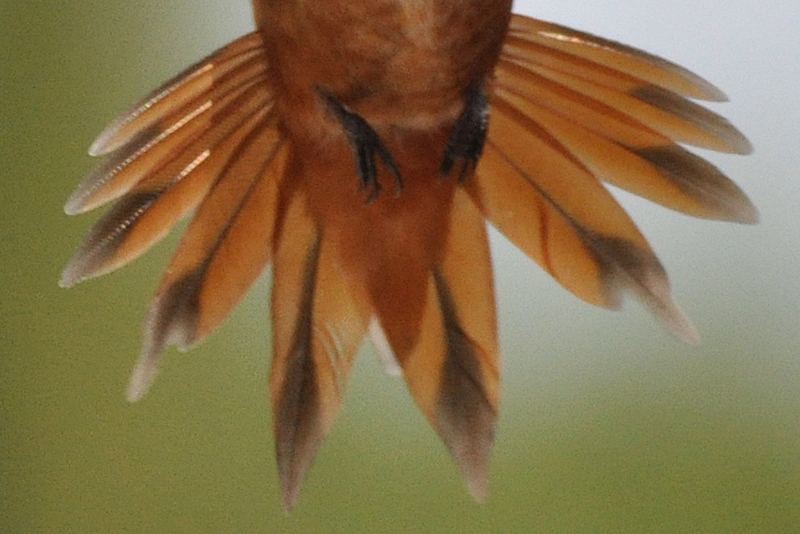 Rufous Hummingbird female hatch year tail. Note the side shot of the hatch year female a few shots up. R2 specifically show coloration above the terminal black. The tail below shows coloration above the black on R2. 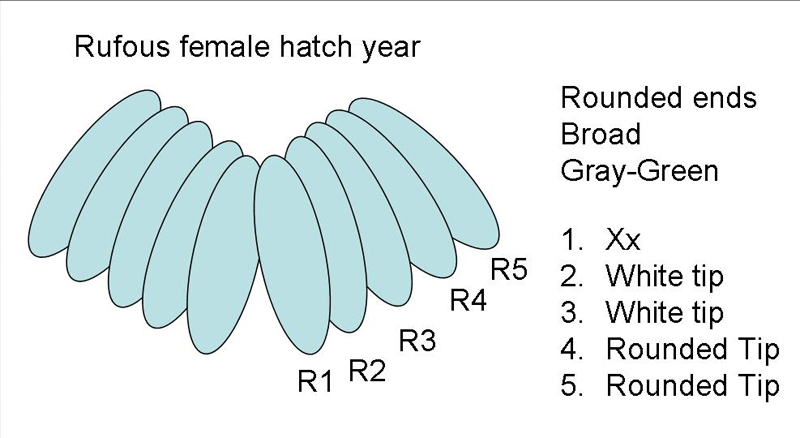 The rounded tip and white end on R2 makes this bird a hatch year female. 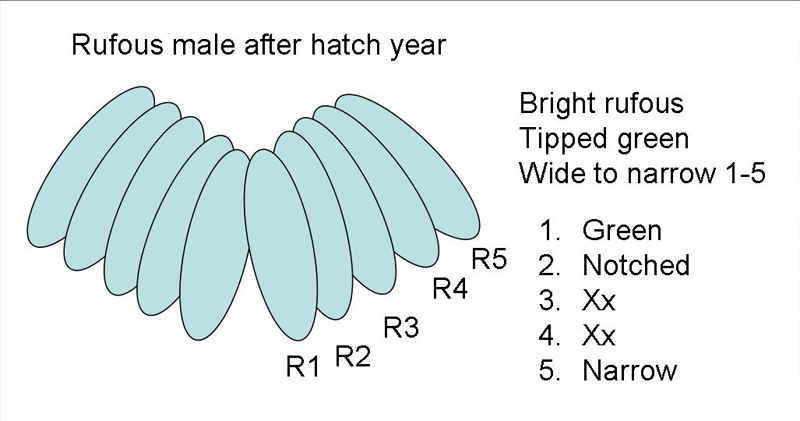 A nice angle of another hatch year female. 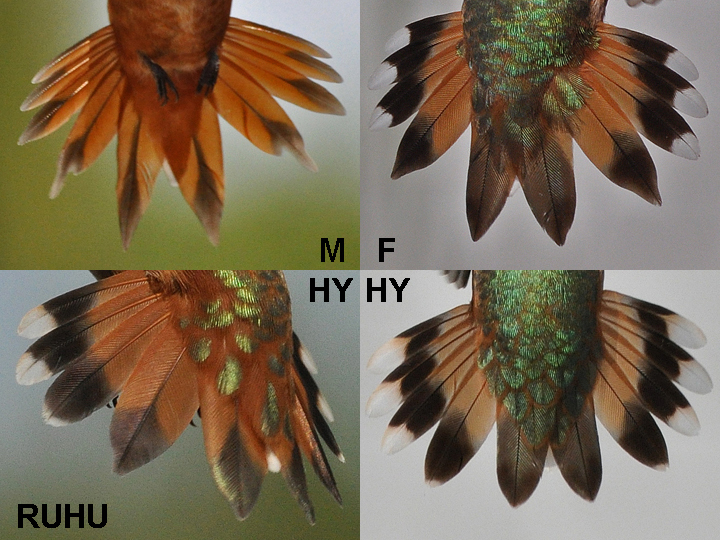 Rufous Hummingbird wing, note that P8 on down get progressively more narrow. 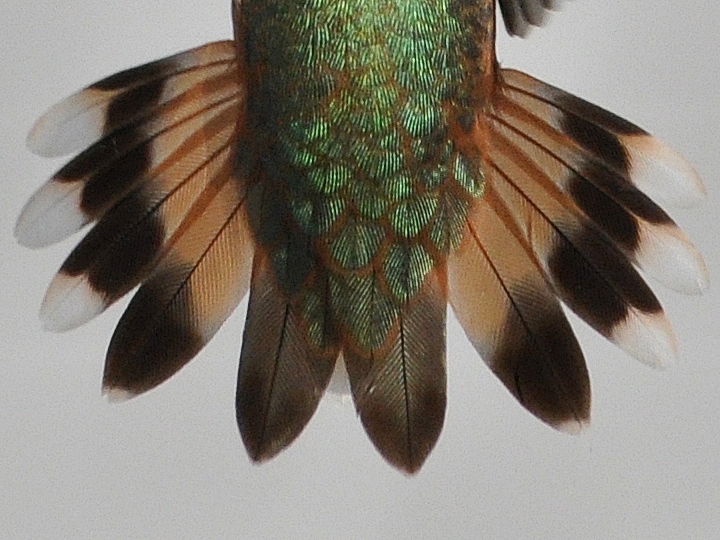 Rufous Hummingbird wing, note that P9 and P10 are pointed. 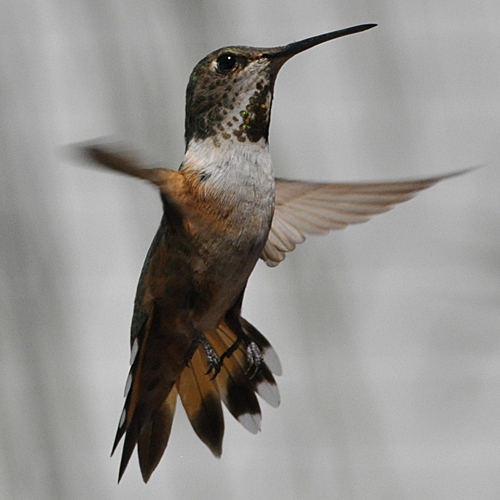 Rufous Hummingbird tail length is long and extends well beyond the wing tips. 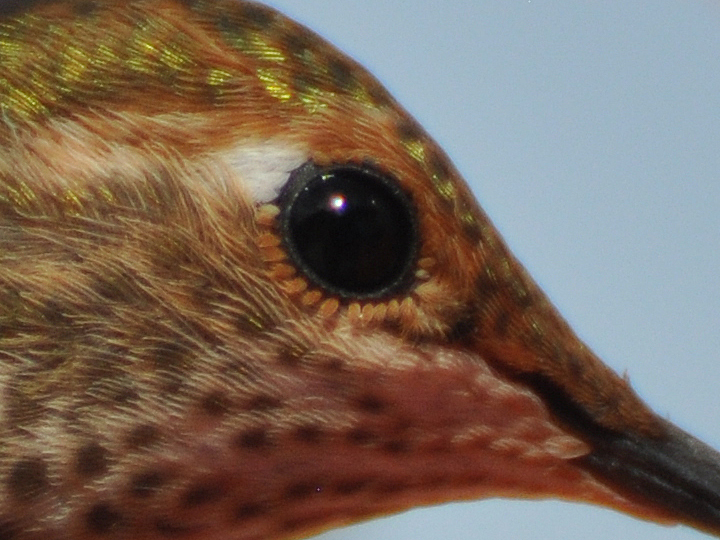 Does a Rufous Hummingbird have eyelashes? They are called periorbital feathers. 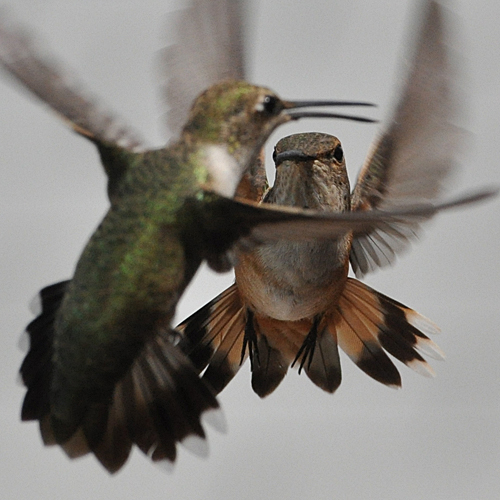 A Rufous Hummingbird being nudged by a Black-chinned Hummingbird. Truly some fantastic shots. Wonderful insights! 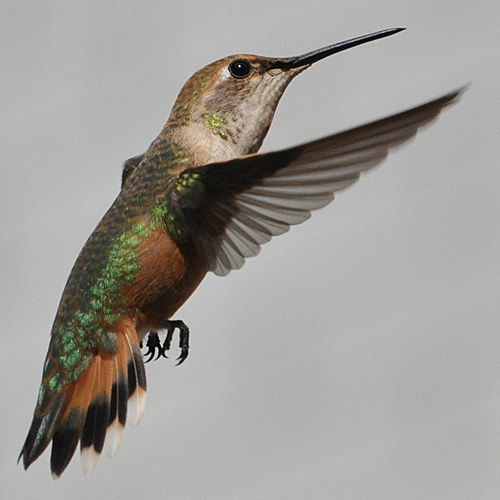 Really beautiful photos and the page is really helpful as I try to understand the taxonomy of the western hummingbirds, especially the difference between Allen’s and the Rufous. I had a question for you about usage rights of your photos. I assume this is a public posting so I would appreciate it if you would email me back.